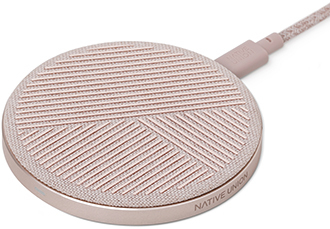 Elegantly designed and engineered for quick wireless charging, DROP is a welcome addition to any room. DROP provides fast and secure wireless charging for iPhone 8, iPhone 8 Plus, iPhone X and all other Qi compatible devices. On average, DROP will charge a new generation iPhone 16 minutes faster than other wireless chargers. The silicone tread on the charger keeps your device in place when charging and prevents overheating for optimum charging speed. DROP works with lightweight cases up to 3mm think, so there’s no need to remove your phone from its case to charge. To make your charging experience even more convenient, DROP comes with a 6.5 foot USB-A to USB-C charging cable.